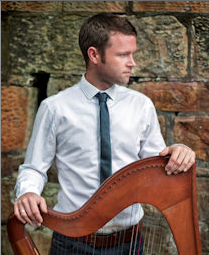 Declan Hegarty Harpist is an absolute master of the Harp and Clarsach (small Scottish Harp). Declan is in demand for weddings, Scottish nights and corporate work not just for his musical ability but for the slick delivery of beautiful music played with style and panache. Declan has performed in dozens of recording sessions and live broadcasts for both Television and Radio. He has played for the Pope and the Queen on their visits to Glasgow. Declan has performed in most of the top venues in Glasgow and Edinburgh including: Hiltons, Marriotts, Oran Mor, Crowne Plaza, Radisson Blue, Cameron House, Boclair House, Hilton Grosvenor , The Corinthian , SECC, Doubletree Hilton, The Royal Yacht, Hilton Dunblane Hydro, One Devonshire Gardens & House for an Art Lover to name just a few. Declan has performed solo and with folk groups. He is also an accomplished guitarist/ singer and over the years has developed a voice and guitar style which allowed him to branch out. He is in much demand both as a harpist and singer /guitarist. The Harp is a wonderful instrument with a long history dating back almost 5000 years. It is a beautiful accompaniment to a wedding, champagne reception or VIP event, the harp’s angelic sound fits well with most events. Call or email Neil Drover to book Declan Hegarty & add a touch of class to your special day.